Connect with us on Trip Advisor and Facebook! The Museum is handicapped accessible. Wheelchairs are available at no charge for visitors. Call in advance if assistance is required: There are two elevators, one at either end of the building. No lighting device is to be used with still or video cameras. Sorry, no pets allowed, although service dogs are welcome. The Museum is a smoke-free environment. Located in the heart of the Columbia River Gorge National Scenic Area, the Columbia Gorge Interpretive Center Museum brings to life the human stories and natural history of one of our nation’s most compelling landscapes. The mission of the Columbia Gorge Interpretive Center Museum is to share the story of Skamania County and the Columbia River Gorge. The Skamania County Historical Society will assemble, collect, preserve, exhibit and make available for future generations any and all historical data, information and artifacts, obtained for the education and enjoyment of Skamania County and Columbia River Gorge residents and visitors. We invite you to come experience 15,000 years of history. 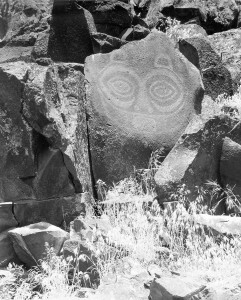 The logo for the Columbia Gorge Interpretive Center is the petroglyph, “Tsagaglalal” or “She Who Watches.” Tsagaglalal is located on a cliff overlooking the Columbia River at Columbia Hills State Park (formerly known as Horse Thief State Park) in Washington. It is one of the best examples of aboriginal art in the United States. A woman was chief of all who lived in this region. That was a long time before Coyote came up the river and changed things, and the people were not yet real people. After a time Coyote, in his travels, came to this place and asked the inhabitants if they were living well or ill. They sent him to their chief, who lived up in the rocks, where she could look down on the village and know what was going on. “I am teaching them to live well and build good houses,” she said. People know that “Tsagaglalal” sees all things for whenever they are looking at her, those large eyes are watching them. On June 14, 1987, Nelson Moses, a spokesman for the Wishram band of the Yakama Nation, dedicated “Tsagaglalal’s” spirit to the Columbia Gorge Interpretive Center Musuem project. The brief but solemn ceremony was held on site in front of “Tsagaglalal.” It was performed in the Indian language based on the ancient bell ritual of the Washat religion, granting permission for “Her” stylized image to be use as a logo. This legend applies to the mission of the Columbia Gorge Interpretive Center Museum, in that, “She is watching over the people and the river,” as we will strive to carefully watch over and be good stewards of the history of Skamania County and the Gorge. Carved in stone and observing the Gorge for centuries from a basalt cliff on the Gorge’s Washington State side, “Tsagaglalal” has inspired the many citizens who persisted in making their dream of the Columbia Gorge Interpretive Center Museum a reality. The Columbia Gorge Interpretive Center Museum is affiliated with several prominent chambers, institutions and other museums. Take I-84 East, to Exit 44- Cascade Locks. Follow the signs to cross the toll bridge, Bridge of the Gods. Turn right onto SR-14 East. After 1 ½ miles, turn left onto Rock Creek Dr. Proceed 1 block. Turn right into entrance. Take SR-14 East for 45 ½ miles. Turn left onto Rock Creek Dr.Proceed 1 block, turn right into entrance. Take I-84 West to Exit 44. Follow signs through Cascade Locks to toll bridge. Cross the Bridge of the Gods. Turn right or east onto SR-14. After1 ½ miles, turn left onto Rock Creek Dr. Proceed 1 block. Turn right into entrance. Take SR-14 West through Stevenson, WA. Turn right onto Rock Creek Drive. Proceed east one block. Turn right into entrance. Call us at (509) 427-8211 toll-free at (800) 991-2338.